Want to get more from your Manufacturing software? What if you could get Product Design Suite for less than $200 per month*? With Autodesk® Inventor® on Subscription you get access to the most up-to-date tools to help you get the most out of your investment. 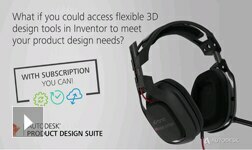 You’ll be able to access flexible 3D design tools to meet your product design needs. 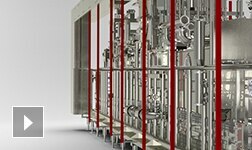 You can also manage your design data more easily than ever with Autodesk Vault. Watch the videos below to learn more about your subscription benefits. you can design even more freely. products by using the new Vault features. better than ever in Inventor. Autodesk Authorized Resellers are independent resellers and free to set their own prices. Reseller prices may vary. Monthly value represents Autodesk SRP for the Autodesk product or service shown based on the purchase of an annual rental plan. Annual rental plans are available directly from Autodesk or through Autodesk authorized resellers, and may not be available through all resellers or in all countries. The Suggested Retail Price (SRP) shown is Autodesk's suggested price for the specified product and services in the United States. The SRP does not include any allowance or provision for installation or taxes. The SRP is displayed for reference purposes only, as the actual retail price is determined by your reseller. Other terms and conditions may apply. Autodesk reserves the right to alter the SRP, product offerings, and specification of its products and services at any time without notice, and is not responsible for typographical, graphical, or other errors that may appear on this site. 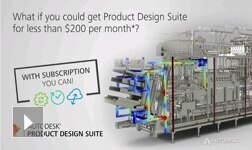 Subscription benefits are subject to Autodesk Subscription terms and conditions. All Subscription benefits may not be available for all products and/or in all languages. All Subscription benefits are not available for all products in all geographies. 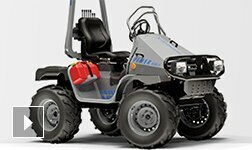 Please consult your Autodesk reseller or sales representative for more information.